These bears are my babies! They are looked after by me and Jessica, and we fight over where they will sleep! I usually win! They are collectibles, and Jess knows not to touch when I am not about! This is Smooch. A completed limited edition from Merrythought. He was a find on ebay, and I fell in love with him straight away! This is a Merrythought Cheeky. It is also a limited edition, and has a little bell in his ear. I love him, but Rich is not too impressed. I thought he was the ideal colour!! 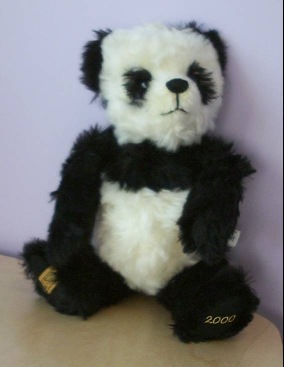 Meet Pandamonium! A Ltd Edn Merrythought. Isn't he cute! 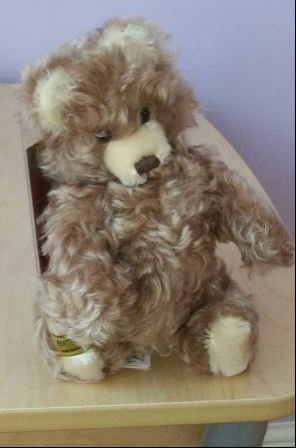 This is Baby Nutmeg, a limited edition Merrythought Bear. 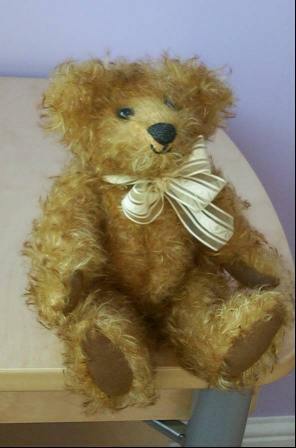 He was my first "named" bear, and was a surprise birthday present off Richard. 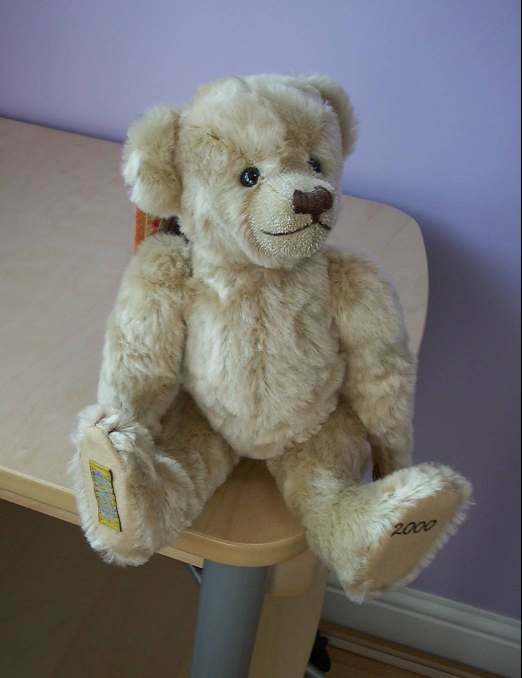 Meet Millenium Bear from Merrythought. He came out in the year of the millenium! He is - you guessed it - a limited edition! He has a growler and Jess is fascinated by the noise! 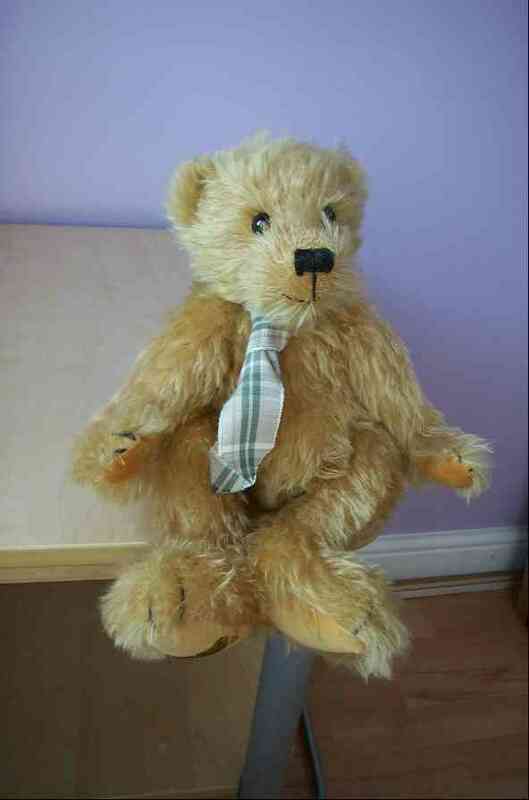 This is my one and only Steiff bear - not a limited edition unfortunately!! He caught my eye in a shop in Stafford, and came home with me that very same day. Thank god for plastic! 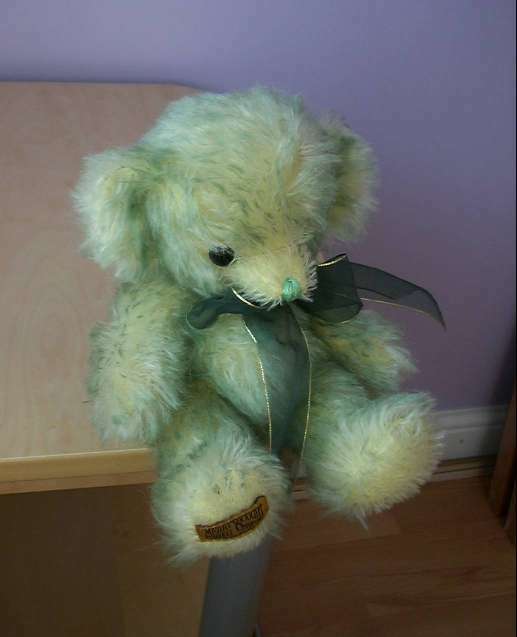 This is my favourite bear. 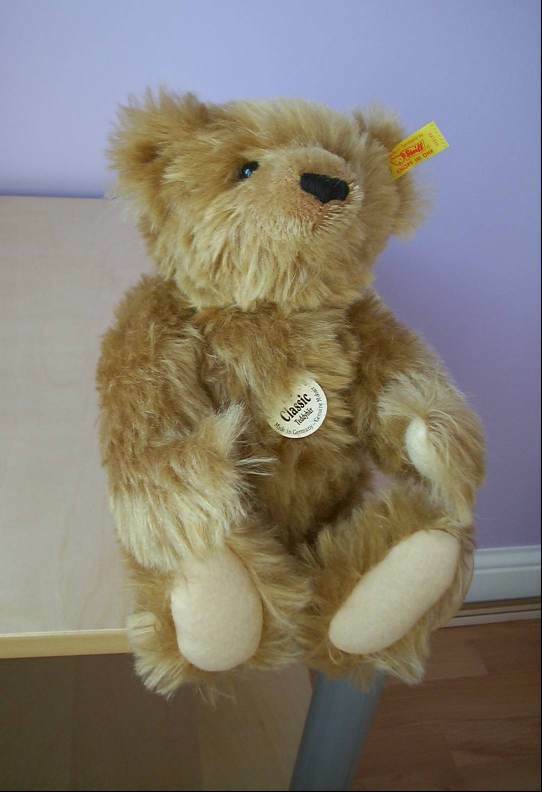 It is from the "Bear Factory" in Merry Hill. You pick a bear skin, watch them stuff it to your liking, and sew it up in front of you. There is a little wish heart inside, and also a taped message from Jessica! Jess picked the slippers! I picked the rest of the clothes. Every night I press his tummy and he says (in Jess's voice) "Night night Mommy!". 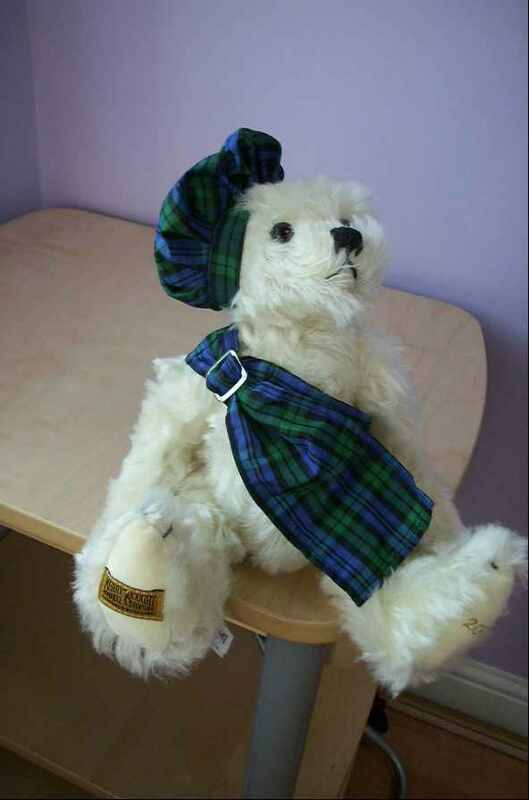 This is my Merrythought limited edition Hogmanay Bear. He looks well dressed up!! This is Titch. He is a local artist bear. 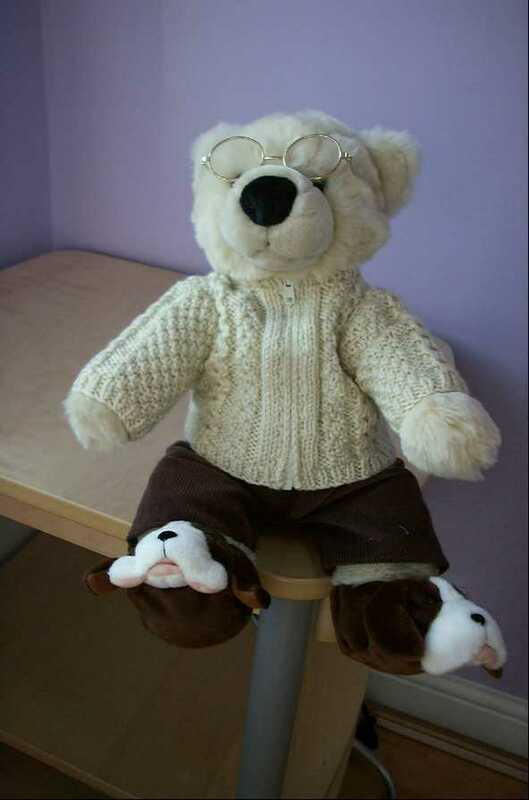 He was made by a lady who runs a bear shop in Stafford. He is adorable. 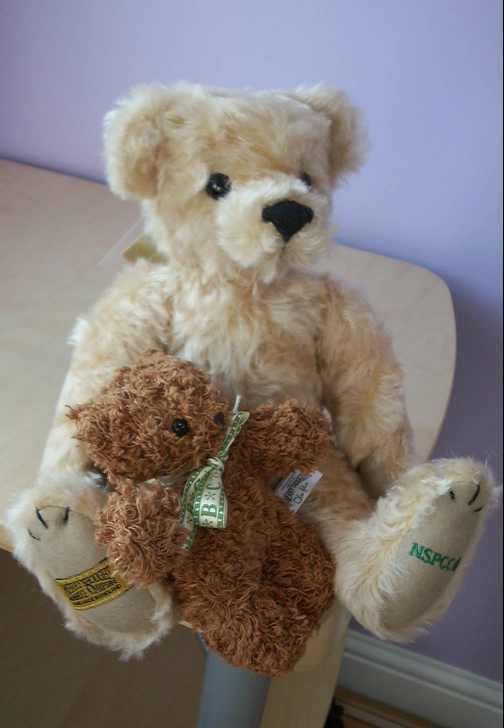 This is Merrythought's NSPCC Bear, a limited edition. A portion of all money made goes to the NSPCC. The Little Ted came with the Big Ted.